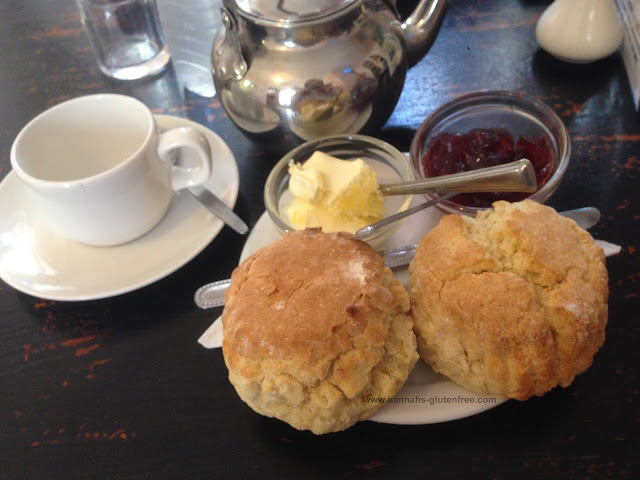 Hannah's Gluten Free : Devon/Cornwall - My week away! Devon/Cornwall - My week away! Last week you may have noticed I was a bit MIA. This is because James and I packed up his little car (which is much smaller than you expect once we stuffed it with all our belongings!) and headed down to Devon/Cornwall. We stayed in a luxury lodge near Bude. This way we could see things in both Cornwall and Devon! Choosing a selfcatering option was fantastic, as we could eat as and when we wanted and was also much easier for me. I was ready for packing picnic's everyday to make sure that there was plenty for me to eat, but surprisingly this was not needed! I won't go through day by day what I ate, as this will bore you all to death, but I will show you some of my highlights! When we first got to the lodge, we had paid for a hamper to be provided as it was Sunday and we knew not many shops would be open. Although I couldn't eat some of the items provided, there was a vast range of food in the hamper, from bread, cereals, juice, milk, bacon, sausage, biscuits, cakes, jams, sugar, coffee, tea, crisps, and that's just to name a few! If you follow me on Instgram you will have seen some of these already. My life revolves around food, not just online! So you bet when I find some good food I am always the one taking a photo of it! Tuesday was our first day out, as Monday we unpacked and did some food shopping, as the shops were so far away this took a day in itself. We decided to go to Dartington Crystal factory. Here we got to see some vases being made and there was a HUGE store to browse, there was a few sneaky purchases of some very reduced vases! We decided to stop by the cafe there rather than hunting another restaurant or cafe. 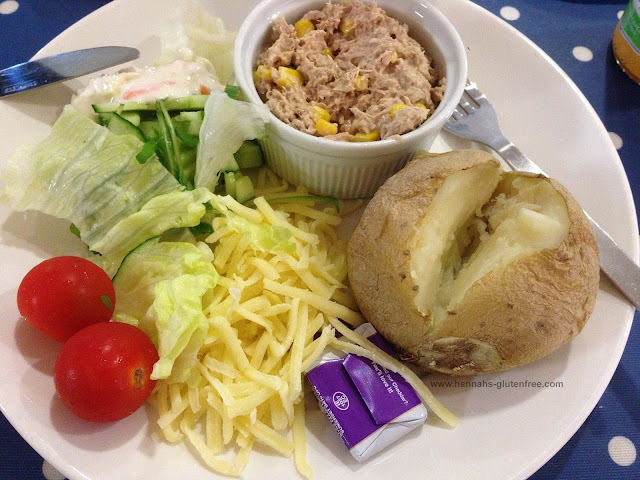 I had a tuna and cheese jacket potato with a side salad, the potato was baked perfectly and honestly was one of the best baked potatoes I have had in a while. 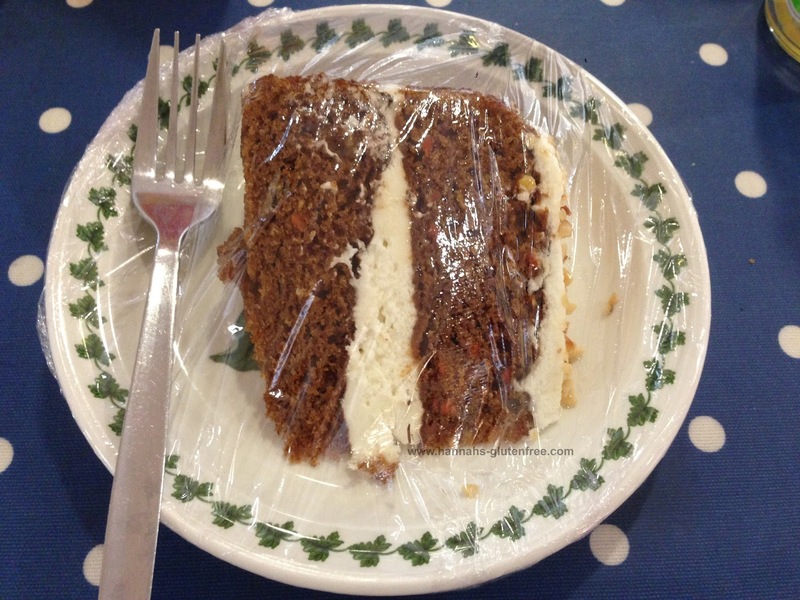 But to follow I had a gluten free carrot cake, yep, that's right, they had a whole fresh cake that was gluten free. Although I knew I would be so full after that and a potato, I just had to try it! It was fantastic! Wednesday - We found a little cafe in Clovelly which had a wide range of gluten free options, from rolls to cream tea. Of course I had a cream tea with a green tea! The two scones were huge so I only managed one. Slightly more crumbly than a typical scone, but I had plenty of cream and jam to keep it stuck together! I could have had rolls too if I'd wanted. I was very impressed from a small independent cafe. Thursday - We decided to visit Boscastle which was a lovely village filled with all sorts of craft shops, completely up my ally! We found a cafe which sold gluten free pasties and the chips were made with local potatoes, so we decided to give them a go! 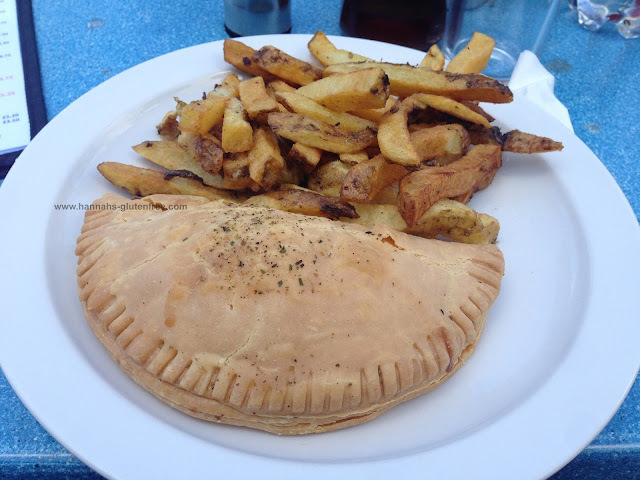 I went for a cheese and onion pasty, the filling and the puffier pastry was great. Although I did leave the crusts as they were a little tough! It was nice that it felt like James and I were enjoying the same meal again whilst eating out. Friday - We went on a garden centre hunting trip and had coffee. We then went home and had some BFree fajitas for lunch as we would be out on saturday and needed to use some chicken up. We then went to Padstow and found Rick Steins fish and chip shop, where gluten free fish is readily available! Unfortunately I was still quite full so we shared some chips but so many people were ordering gluten free, so they had to be good! I hope you liked this slightly different what I ate post!